Various sizes for your needs! Satisfaction Guaranteed. Make your Reservation TODAY! 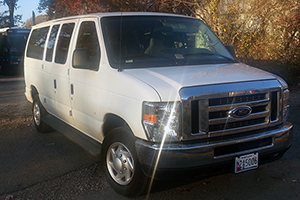 Want to "Thank You" for the most wonderful tour of Washington DC and Mount Vernon on the private air conditioned bus. Most of all want to thank you for our tour guide, Bill. We felt we were being shown the city by someone who really knew all there is to know about the DC area. He was a safe driver and when he found out my husband was retired Air Force he made a special unplanned stop at the Air Force Memorial which we didn't know existed. That was very much appreciated. I will certainly recommend your company to everyone. 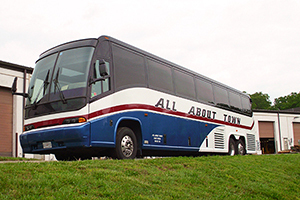 We have been working with All About Town, Inc. for our coach bus needs for over 10 years. 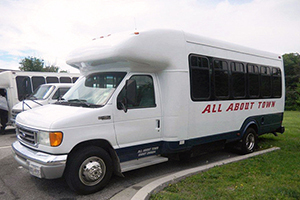 We use their buses for movie extras transportation. Our schedule can be hectic, challenging, and could change in a moment's notice and they always work with us with last minute changes. All About Town's staff are professional, knowledgeable, and courteous! Copyright @ All About Town, Inc. All rights reserved.